There are many different DFS projection systems out there, all with the promises of secret, advanced algorithms and guaranteed winning projections. But which projection system is really the best? We’ve done the analysis, and found that DFSnerd is the best out there. After running correlations on the results of several projection systems, DFSnerd performed significantly better than every other projection system over the NBA and NFL seasons. Below, I’ll go through how DFSnerd makes their projections and some of the great features DFSnerd provides. They aren’t just a projection system, they’re a complete DFS lineup creator from start to finish. DFSnerd provides completely free projections for NBA, NFL, and MLB, as shown above. In their projections, they breakdown some of the factors used in formulating the projections, although they do not give away their exact formula (for obvious reasons). DFSnerd allows you to edit the projections yourself, so if you disagree with a players expectation, you have the freedom to alter it. This is a fantastic feature if you plan on exporting these projections to .csv, or use their lineup optimizer to create your lineups for the big tournaments on DraftKings and FanDuel. 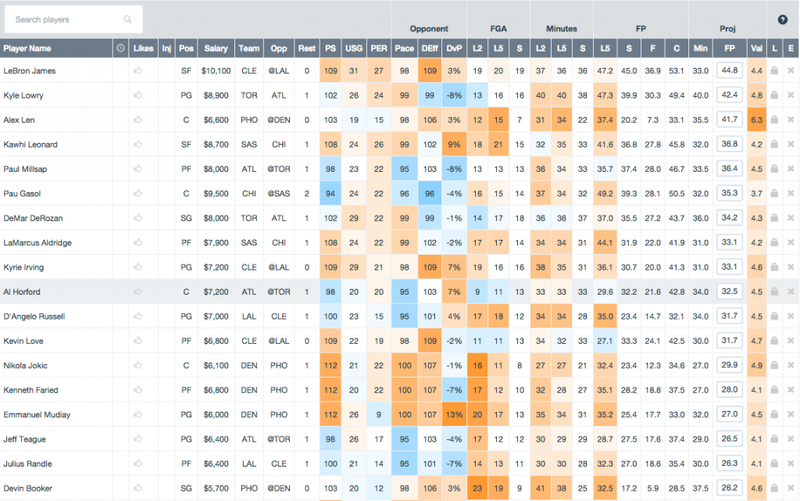 The Lineup Optimizer is only available to premium subscribers, but it is a fantastic tool for turning your customized DFSnerd projections into lineups. 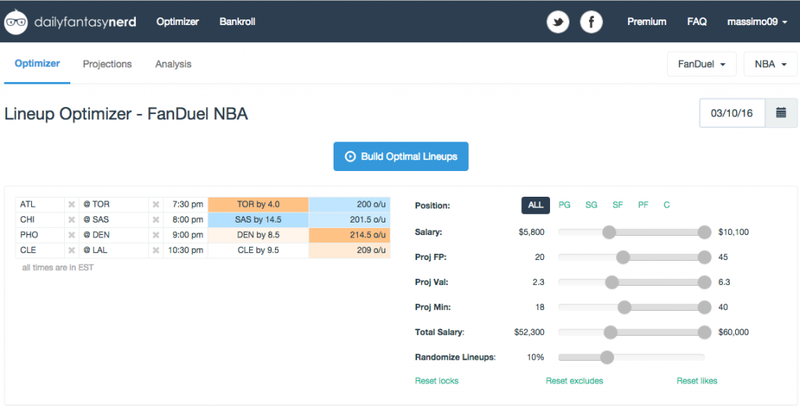 The optimizer allows you to set parameters like a minimum or maximum projected value, to ensure your lineups come out exactly to your standards. Once you press the “Build Optimal Lineups” button, the Optimizer will create 10-40 of the best lineups given the projections and your parameters. These lineups can easily be exported into a .csv file to be uploaded onto any Daily Fantasy Website. DFSnerd has 3 different levels of paid membership, and offers a 7-day free trial for each level. Each level of membership has added benefits. Veteran is the cheapest level, but restricts your DFSnerd projections to one DFS site. You are also given only 10 lineups per optimization. If you’re a player who likes to stick to one site, and you’re not a heavy GPP player, Veteran is a reasonable level for you. 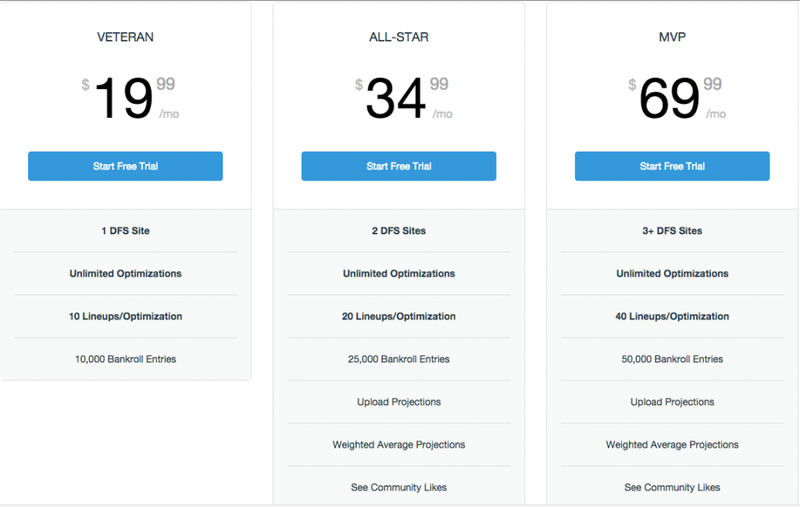 The added benefits of All-Star: Now you can use the projections for two DFS sites. You can also upload your own projections and weight them with DFSnerd’s to create your own Weighted Average Projections. You can also create 20 lineups per optimization. If you’re a more serious GPP player, All-Star is a fitting level for you. The top level of DFSnerd Premium, MVP adds much more flexibility. You get 40 lineups per optimization and can use their projections for as many DFS sites as you like. My favorite feature of MVP is the Projection Correlation Analysis. At the end of each day, DFSnerd shows you how well your overall projections correlated with the actual results of the day. You can compare your results with DFSnerd’s unaltered projections and see whether your tinkering helps or hurts your results from day to day. It is the best evaluator out there and if you’re a serious DFS player, it is a must have. DFSnerd offers a 7-day free trial of their premium memberships. Sign up through the link below to try it out!